It’s no secret I love farm animals. I love animals of any kind – even snakes. 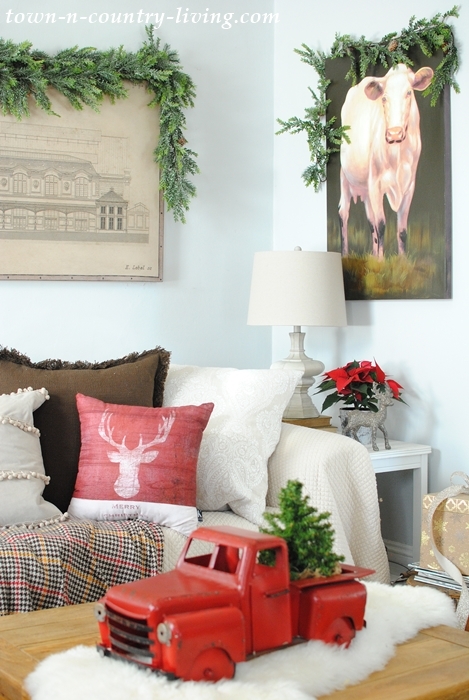 I also enjoy decorating with farm animals throughout my home. No, not the real type of animals, regardless of how cute they are. 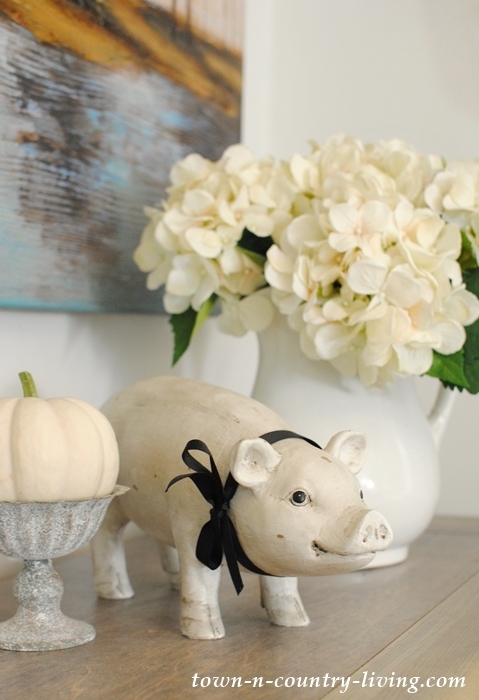 I’m talking about decorating with these types of farm animals – the statuary kind like those on my buffet. More importantly, the kind that don’t make a mess in the house. But one wasn’t enough so I added another one in our family room. You might remember seeing her during my casual Christmas tour. Then I found a large wooden sign that shows different types of cows. I placed it over my new console table in the dining room. My kitchen was feeling a little left out so I added a farmhouse sign with a dairy cow. 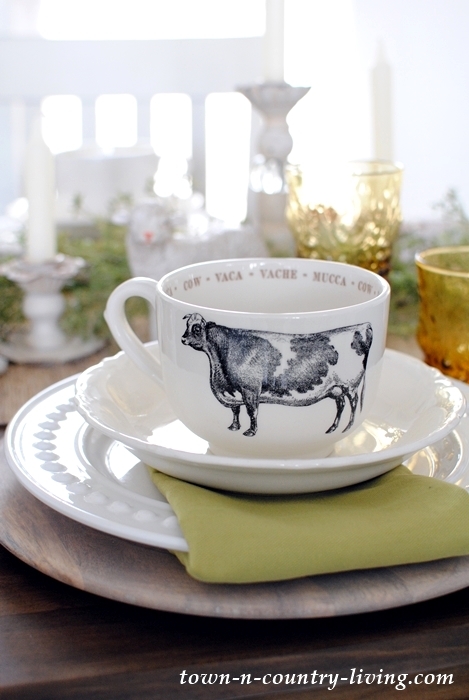 A collection of mugs with farmhouse animals are perfect in the breakfast nook for sipping coffee, slurping soup, or feasting on a morning breakfast bowl of cereal. 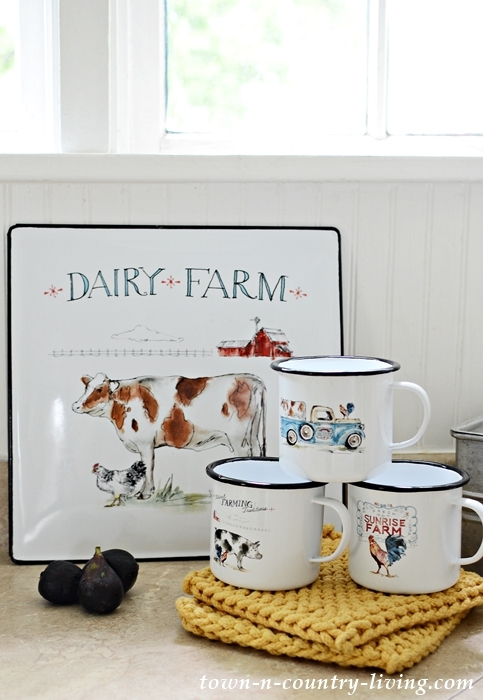 I recently added an enamel dairy sign to the kitchen, along with matching mugs that feature a few other farmhouse animals, namely pigs and roosters. I drink iced coffee from one of these adorable mugs every morning. They’re my fave! 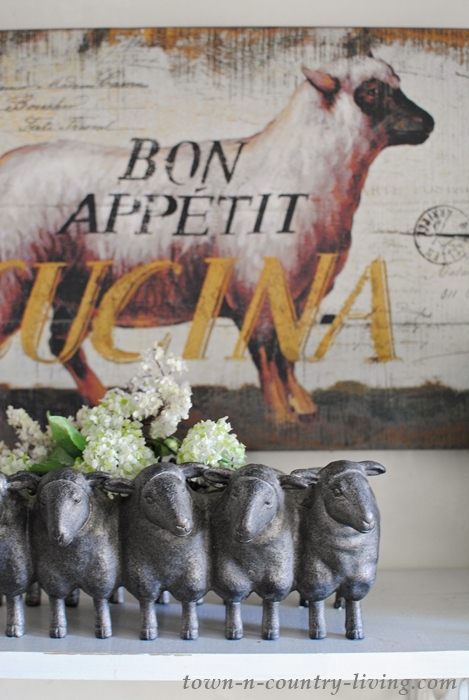 Sheep artwork at French Country Cottage inspired me to add a few ewes to my own abode. The first place that received lamb art was my kitchen. 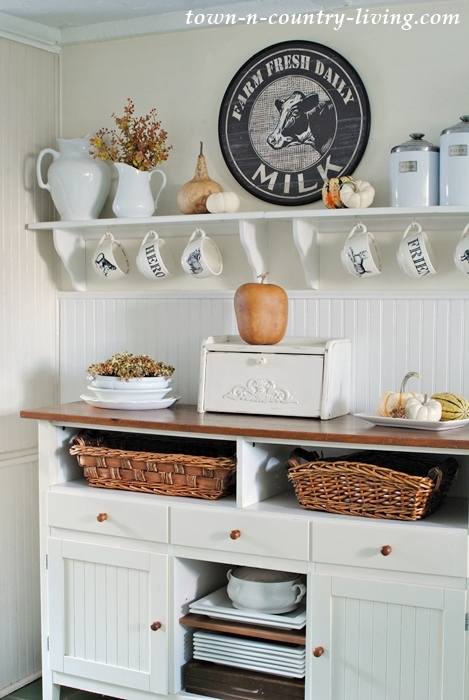 Soon after, I added a whimsical sheep planter in the kitchen. 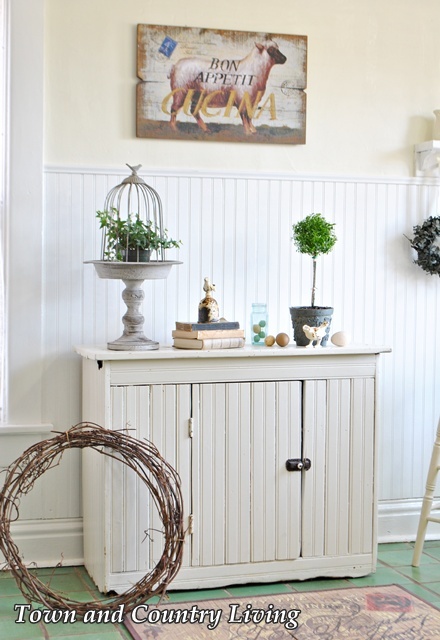 The planter gets moved around from room to room. 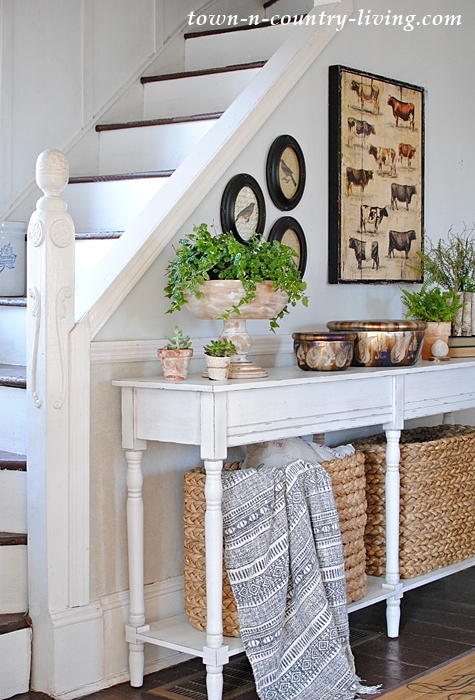 Last year I added this pretty black and white sheep print in our entryway. I feel like it lets visitors know right away that they’re going to see plenty of farm animals in our home. I think I need to work on my pig collection. I have this cute little guy that gets a different colored ribbon depending on the season. 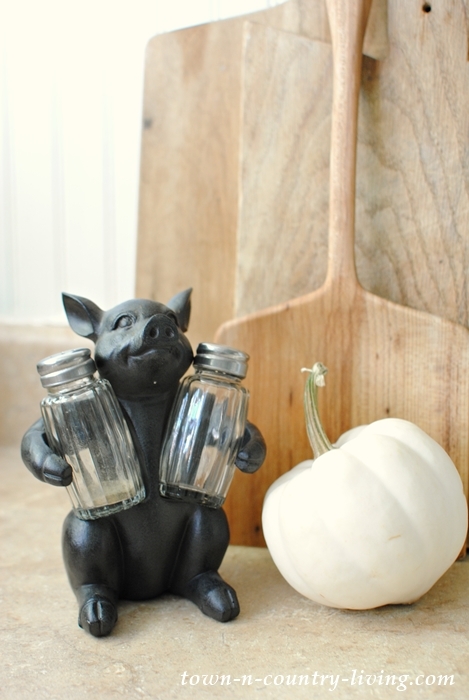 And not too long ago I found a little piggy salt and pepper shaker. So you see, farm animals in the house can provide purpose beyond looking cute and charming. 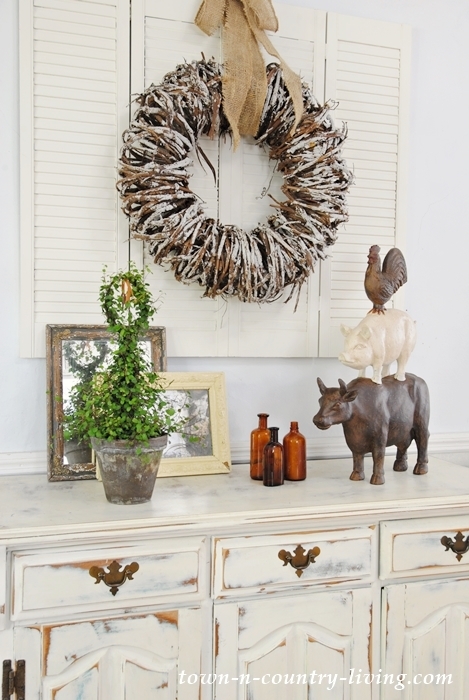 Besides my love for animals, I decided to start decorating with farm animals as a way to bring our outdoor surroundings inside. We live where the Chicago ‘burbs meet the Illinois farms and prairies and I truly enjoy all the things that make up farm life (except for maybe the numerous farm chores). 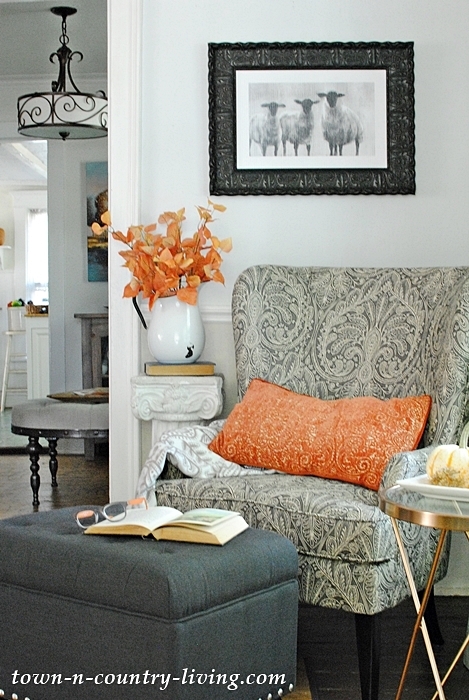 Do you decorate with any items that reflect the area where you live? Oh, your tastes in this are so SIMILAR to mine; I have lots of animal prints and some “critters” sitting around like pink pig salt and peppers, and chicken mugs, and I actually have two metal hens pecking for food on my dining room table–one on either side of my galvanized metal candle lantern, and ceramic chickens on either side of my bread box, which also has roosters on it. I think one of my very favorite is my “smiling sheep” picture which I get a lot of comments on for she makes everyone smile who walks past her. Love this post. Where did you purchase the mugs? I love love love cows too. Has anyone read the book The Secret Life of Cows? 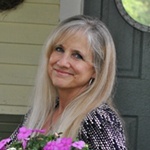 I grew up on a farm in western NC, I love farm animals, real or otherwise!! Loved seeing all your assorted farm animals. I too love all animals and growing up in a farming community, farm animals were my first pets. While I love them all, sheep and baby goats are my favorites and your multiple sheep planter is one of the cutest I’ve ever seen. 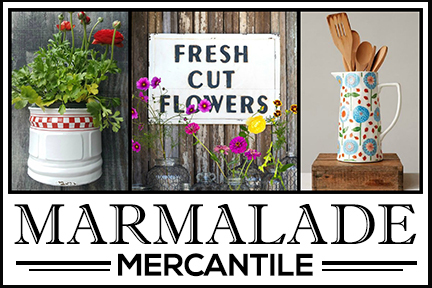 I also love your enamel farm cups and wish I had a set myself. 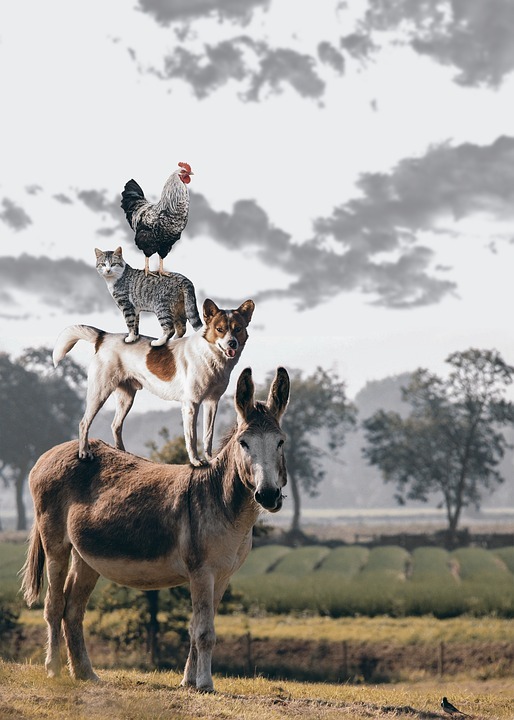 Your home and its decor is a perfect background for your farm animals and you’ve included all of them so artfully and with love. I live in a 1930’s farmhouse in the country in Australia. I can look out of my bathroom windows and see 2 of my horses in the paddock and when we are in the bedroom or the lounge room we can see my other 3 horses. When we are outdoors, the farmer behind us has beef cattle and the farmer to our side has sheep, so we are fortunate to live in this beautiful setting ( rain is desperately needed though). and scattered through my home. I also love all animals except snakes, as we have one of the deadliest snakes in the world living around us, the Eastern Brown Snake, and we usually have a couple of encounters with them every summer. I love farm animals and because of my childhood i keep finding more and more things to add. 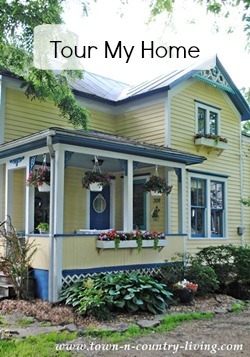 I love all you have and it looks so homey with them in your house.It is much easier having them in my home than getting up before you go to school to feed, although it probably kept we kids out of trouble,lol! I love this post too!! And I loved your kitchen cups, your dairy theme, etc. Do you recall where you got the picture near your steps of all the cows? My niece and husband have a Black Angus farm & I would love to get them this. I’d like to buy it for myself too. I have a condo with a “sun-room” that looks out on a red behind, of what used to be a small working farm. So, I’m changing furniture and looking for pics to decorate with. I have one beautiful picture of sheep and I have other chicken and rooster items. (pictures, ceramic roosters, etc) But, I need to find cows! 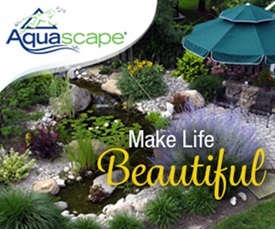 thanks for a wonderful post! I have that same cow poster and love it. Our house in the suburbs of Dallas TX has farm animals in the kitchen. Our other house is in the country surrounded by farm animals and there aren’t any in there! Can you believe it? I hadn’t thought of it before until you asked. Crazy! I’m going to have to change that. I love each and every one of your farm animals though. So stinkin cute! 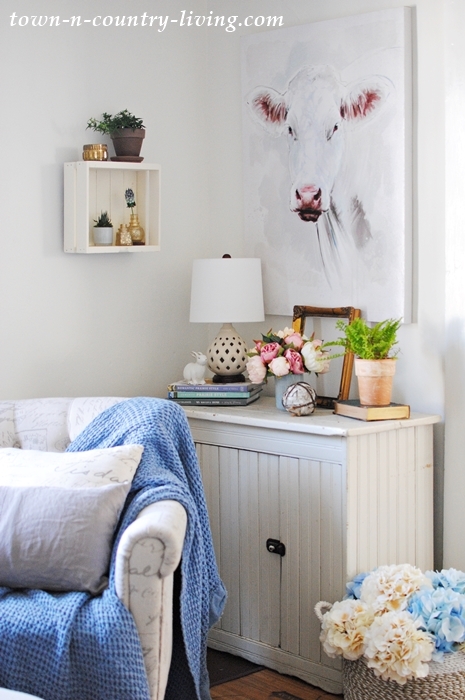 I’m always looking for more cows for my cow themed powder room.It gives my guests something to talk about when they are finished using that room!